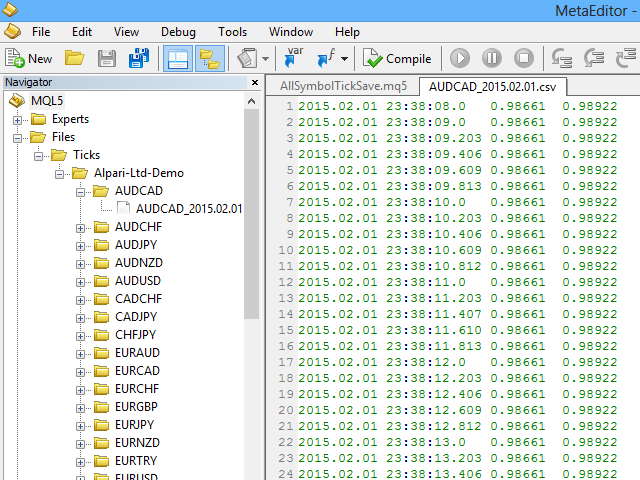 The utility gathers tick history of all currencies selected in the Market Watch window in csv file within the accuracy of milliseconds. It can set time and a type of time of flushing data to the file (server, local host, GMT). The file path is in the directory MQL5\Files\Ticks\<server>\<instrument>. Every day has a separate file. The utility can be launched on every chart. TimeSave — Period of data saving in seconds.